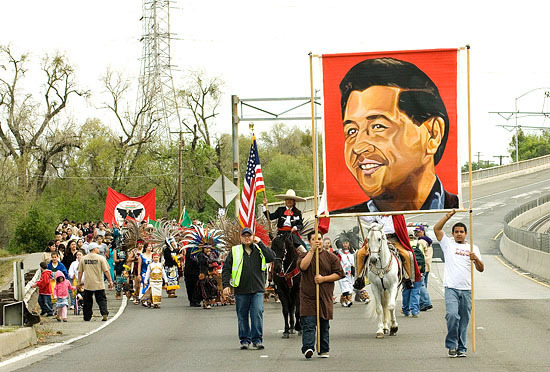 The 2008 annual Cesar Chavez March began at 10 a.m. with a gathering in the parking lot at Los Primos Pizzeria/Taqueria on Northgate Blvd. 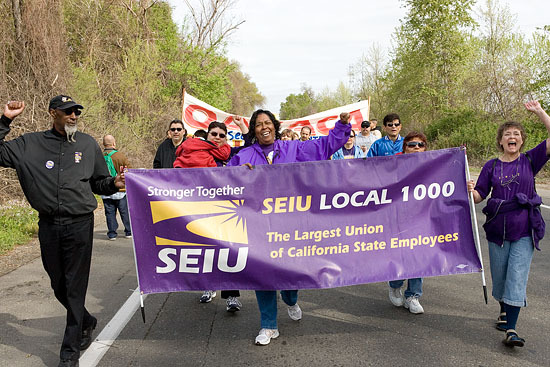 Marchers then proceeded to downtown Sacramento via Hwy 160 and 12th Street, detouring to the Blue Diamond Almond Growers for a brief rally in support of the ILWU's organizing effort at Blue Diamond. 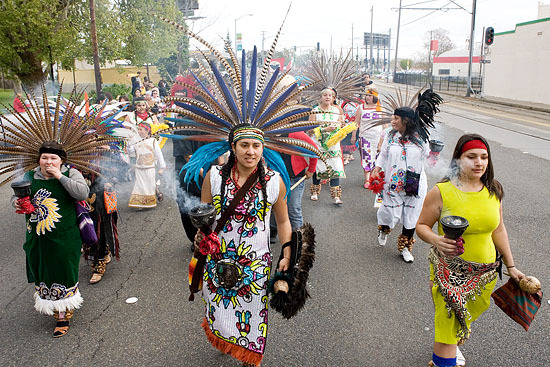 The march ended at Cesar Chavez Plaza with speeches and cultural performances. Most photos are accompanied by excerpts from Cesar Chavez's address to the Commonwealth Club of California, delivered November 9, 1984, in San Francisco. "The consciousness and pride that were raised by our union are alive and thriving inside millions of young Hispanics who will never work on a farm! Like the other immigrant groups, the day will come when we win the economic and political rewards which are in keeping with our numbers in society. The day will come when the politicians do the right thing by our people out of political necessity and not out of charity or idealism. That day may not come this year. That day may not come during this decade. But it will come, someday! And on that day, our nation shall fulfill its creed--and that fulfillment shall enrich us all." "I began to realize what other minority people had discovered: That the only answer--the only hope--was in organizing. More of us had to become citizens. We had to register to vote. 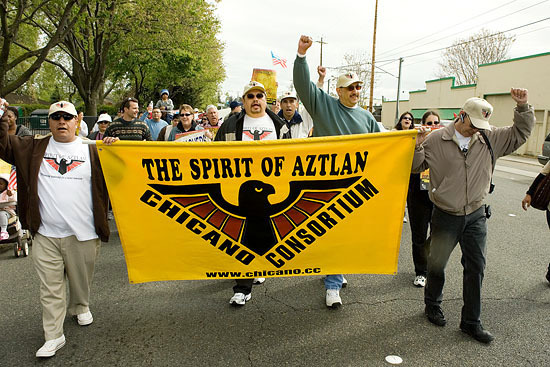 And people like me had to develop the skills it would take to organize, to educate, to help empower the Chicano people. "Those who attack our union often say, 'It's not really a union. It's something else: A social movement. A civil rights movement. It's something dangerous." They're half right. 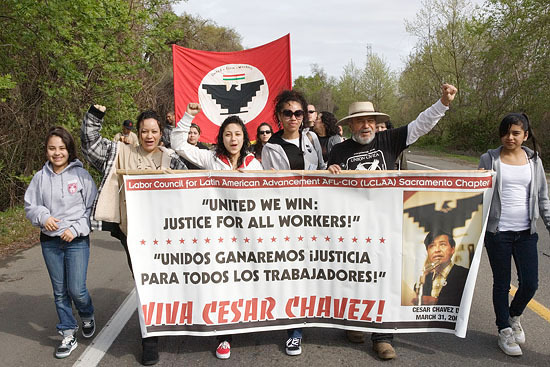 The United Farm Workers is first and foremost a union. A union like any other. A union that either produces for its members on the bread and butter issues or doesn't survive. "The other trend that gives us hope is the monumental growth of Hispanic influence in this country and what that means in increased population, increased social and economic clout, and increased political influence. 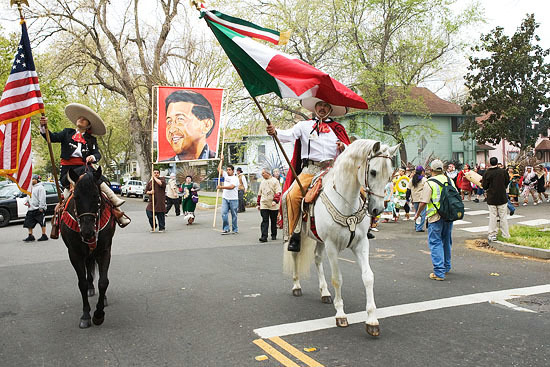 South of the Sacramento River in California, Hispanics now make up more than 25 percent of the population. That figure will top 30 percent by the year 2000. There are 1.1 million Spanish-surnamed registered voters in California; 85 percent are Democrats; only 13 percent are Republicans. 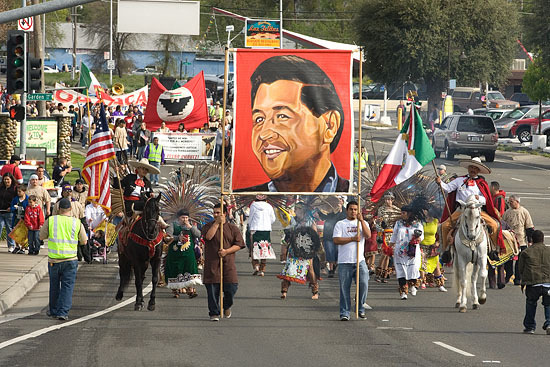 In 1975, there were 200 Hispanic elected officials at all levels of government. In 1984, there are over 400 elected judges, city council members, mayors and legislators. In light of these trends, it is absurd to believe or suggest that we are going to go back in time--as a union or as a people!"